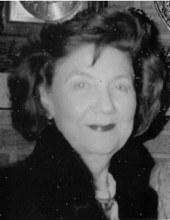 Evelyn “T’Niny” Freeman Bounds, 98, of Hattiesburg, passed away Friday, March 22, 2019 at Merit Health Wesley. Visitation will be Thursday, March 28, 2019 at Moore Funeral Home in Hattiesburg from 11:30 a.m. – 1:30 p.m. with services immediately following at 1:30 p.m. Burial will be in J.P. (Jess) Bounds Memorial Cemetery in Carnes, MS.
Mrs. Bounds was a homemaker. She was the Secretary of her Sunday school class for senior adult ladies at the former First Baptist Church of Hattiesburg. She was preceded in death by her husband, Houston Davis “Rip” Bounds; one daughter, Linda Elaine Bounds; her parents, Dave and Maude Freeman; two sisters; and her companion and loving dog, Misty. She is survived by three daughters, Jenny Hurt (John) of Hattiesburg, Nancy Miller of Hattiesburg, and Evelyn Hall (Ed) of Nunnelly, TN; four grandchildren, Ashly Miller Hudson of Hattiesburg, Oliver G.D. Oliver of Hawthorne, FL, Alicia Miller Ray (Chad) of Sumrall, and Kane Hall of Eugene, OR; three great grandchildren, Tristan Saucier of Oak Grove, Alcus Ray Hudson of Hattiesburg, and Warren Hudson of Hattiesburg. The family would like to thank Mrs. Bounds’ sitters, the staff at Provisions Living, Dr. David Lee, and Forrest General Hospice. In lieu of flowers, the family requests donations be made to the Alzheimer’s Association. To send flowers or a remembrance gift to the family of Evelyn Freeman Bounds, please visit our Tribute Store. "Email Address" would like to share the life celebration of Evelyn Freeman Bounds. Click on the "link" to go to share a favorite memory or leave a condolence message for the family.